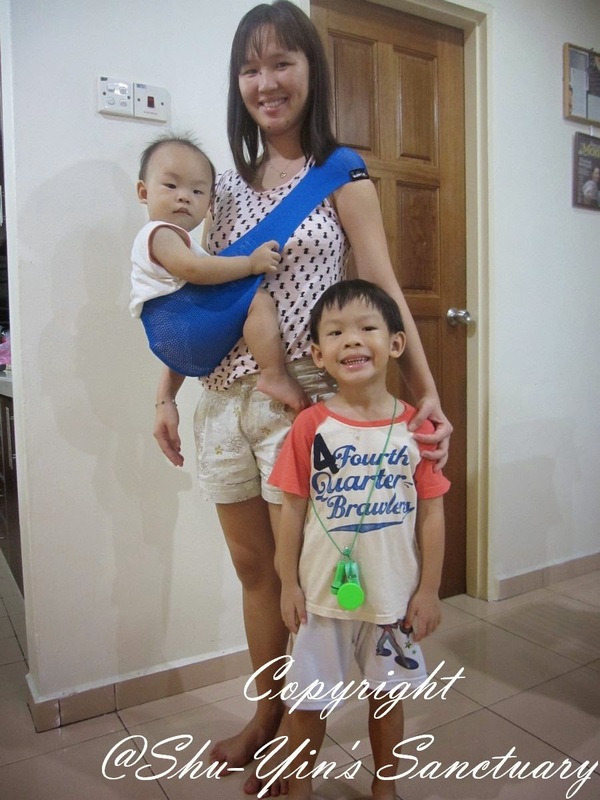 When mummytoon contacted me to do a review on a baby carrier, it was the first time I heard about SUPPORi. Originating from Japan, SUPPORi is an award winning, innovative baby sling, and is one of the top selling baby carriers in Japan. 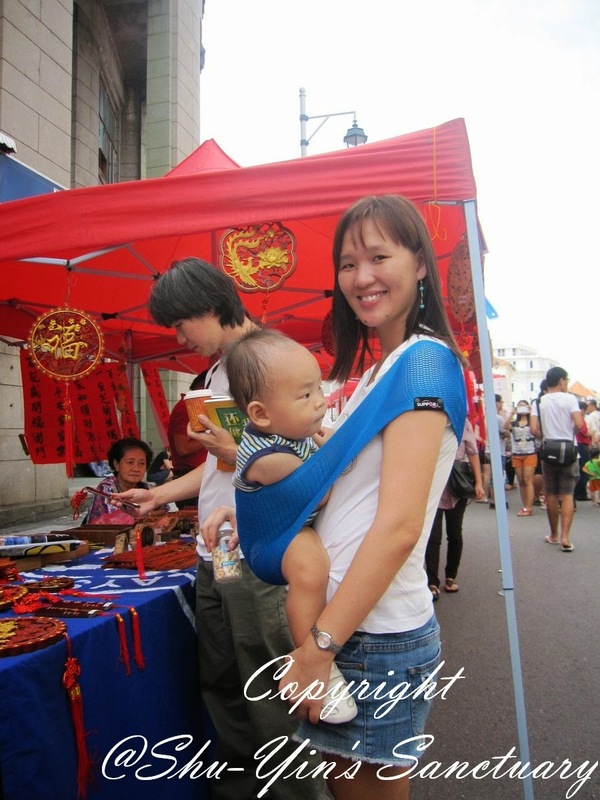 It is a fitted sling worn close to your body so your baby will feel safe and secure. 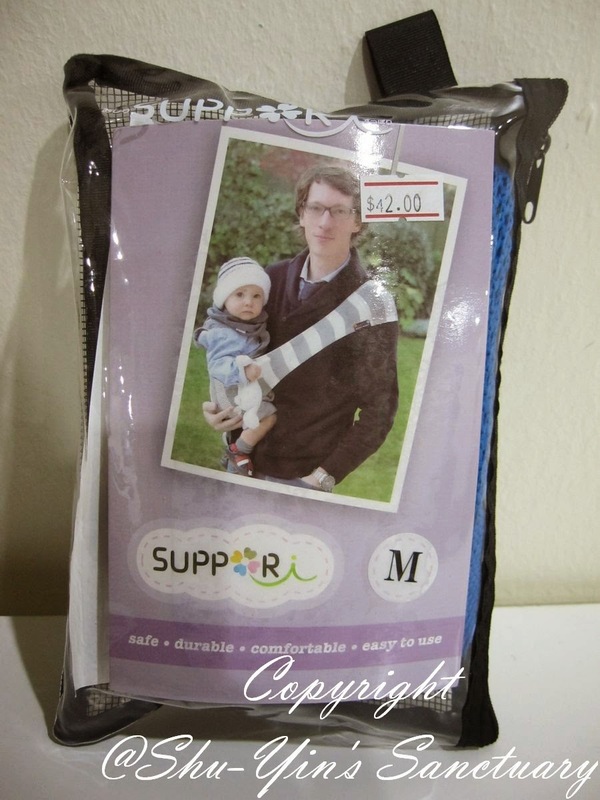 The SUPPORi baby sling came in a little transparent plastic zippered pouch. It has a nice little handle just in case you need to hang it or strap it somewhere, which I feel is such a nice little touch to its packaging. 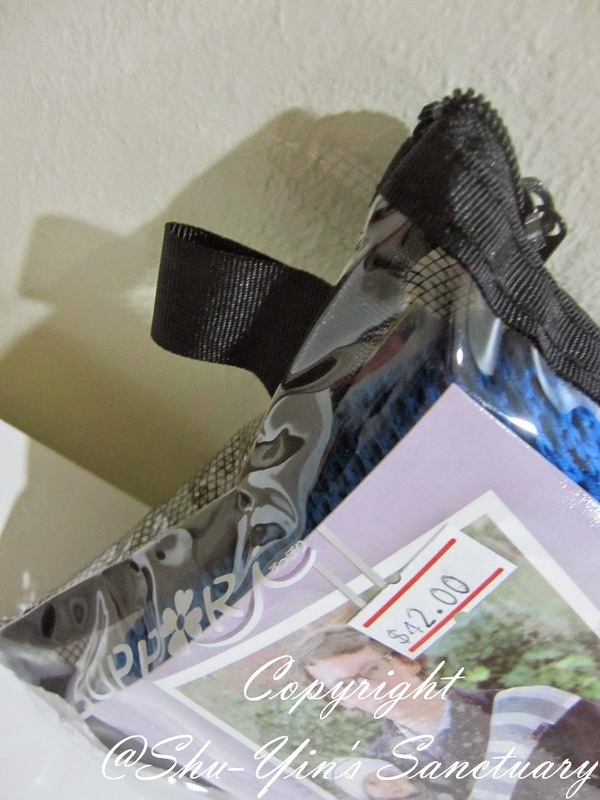 I can see so much other usage for this pouch, making it my toiletries bag when I travel, or to stash some money and cards inside for a quick outing or something, all these made possible because it is secured with a zip! Love this multi-purpose pouch. I chose the Bright Blue colour, because I prefer a bright colour so that it doesn't attract mosquitoes. Ok, that's just me. 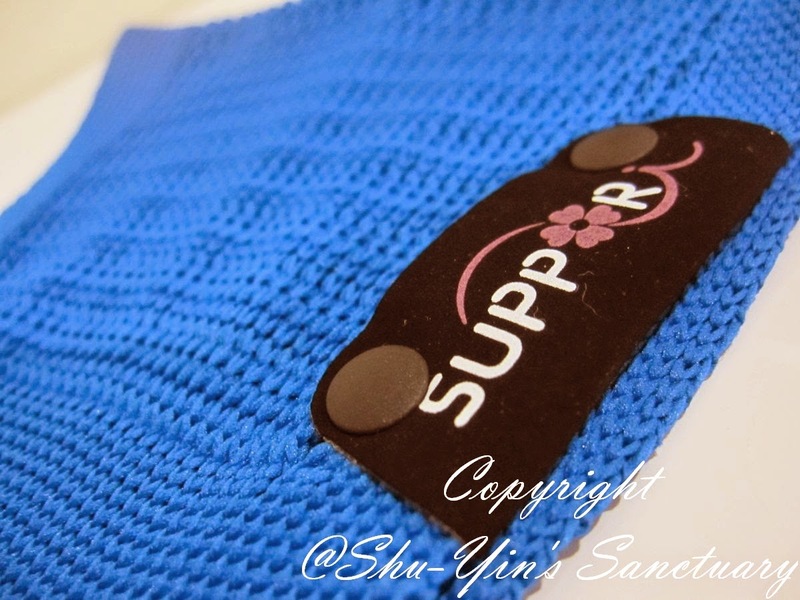 The SUPPORi logo/brand proudly stitched on the sling. Production: latest weaving machines are used. Inspection: all parts are made in Japan and inspected in order not to pass small defects. 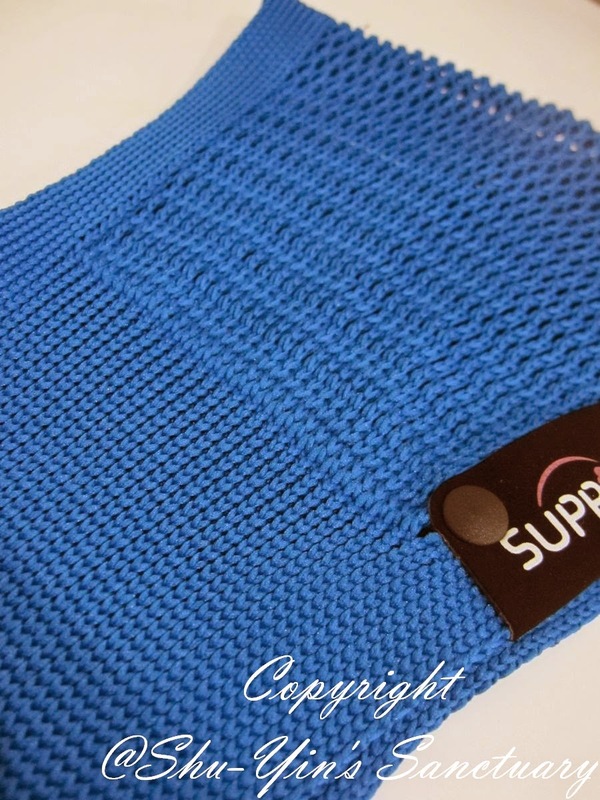 The SUPPORi is also air-permeable, which is perfect for our hot and humid climate. 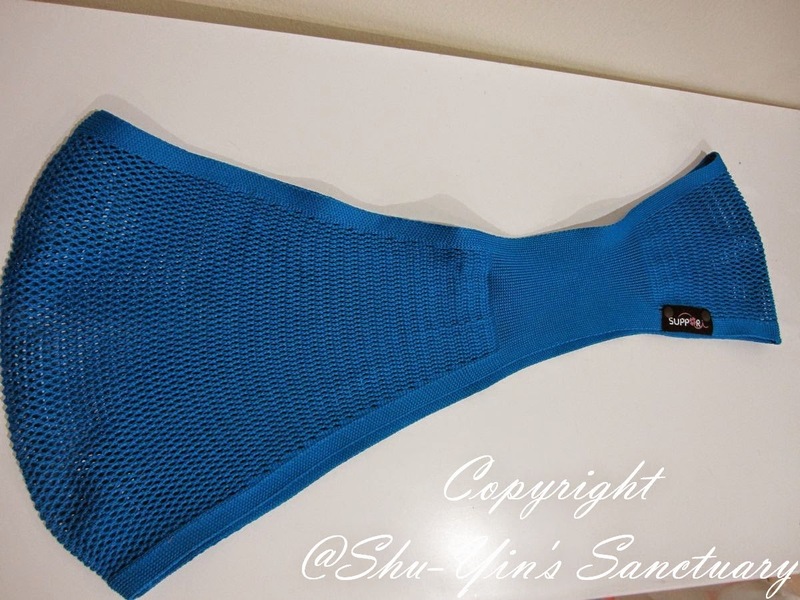 It's triple thread, triple woven mesh structure allows for air flow. There are also a wide range of colours and patterns for you to choose from. No more plain and boring black and white, so mothers and fathers can still be a fashionista while carrying your child! Look at the wide selection and you will be spoiled for choice! Very easy to use - just 3 simple steps! I've always love simple carriers, which was why I love my soft structured carriers which are simple to wear and to take out - just buckle in and out! 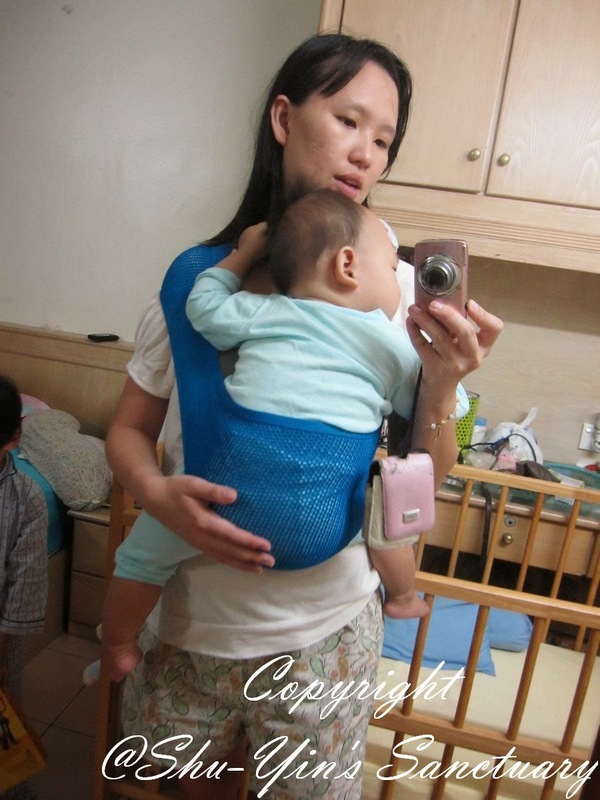 So this one even easier, just wear the sling across my body and plopped in my baby, making sure baby's back and hips are covered. 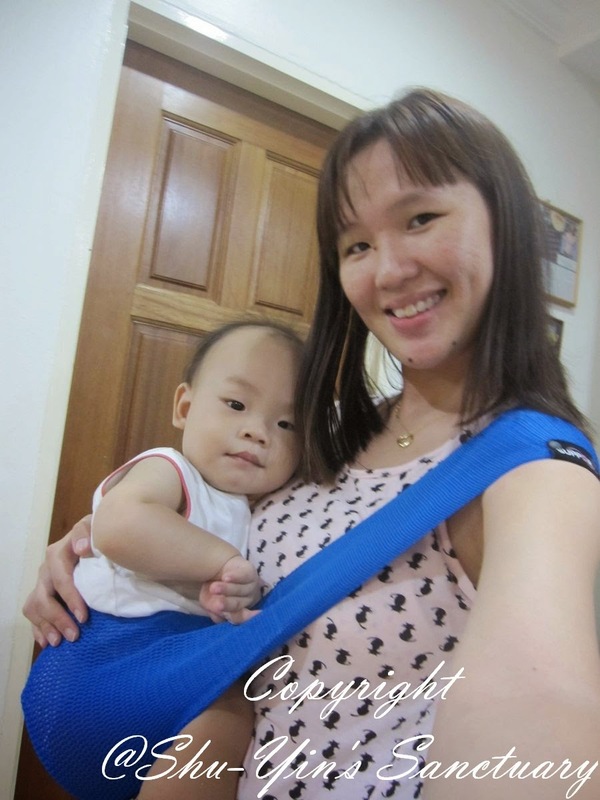 This simple baby sling looks really sleek and easy, just my kind! 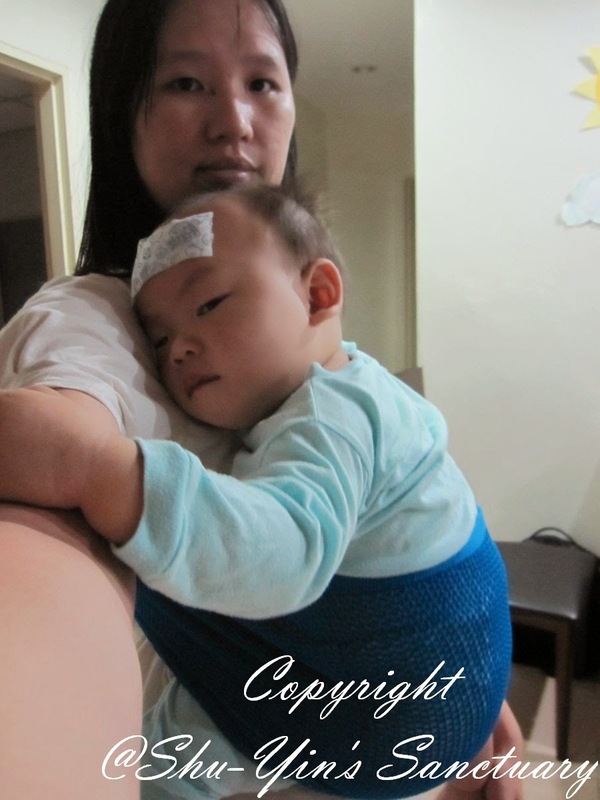 But when I received the SUPPORi baby sling, Khye was 11 months old, and weighed about 10kg. To tell the truth, I was at first a bit hesitant on whether such a small piece of cloth can handle my baby's weight. And also Khye is rather big sized for his age. Upon trying it, I was surprised that my big baby could fit into a teeny SUPPORi. The baby sling somehow stretches and moulded itself to fit Khye. Wearing it was pretty comfortable - no stiff shoulders and other related baby carrier injuries. Although carrying a 10kg baby on just one side of my shoulder, I felt nothing when I first tried it on my deltoid muscle. 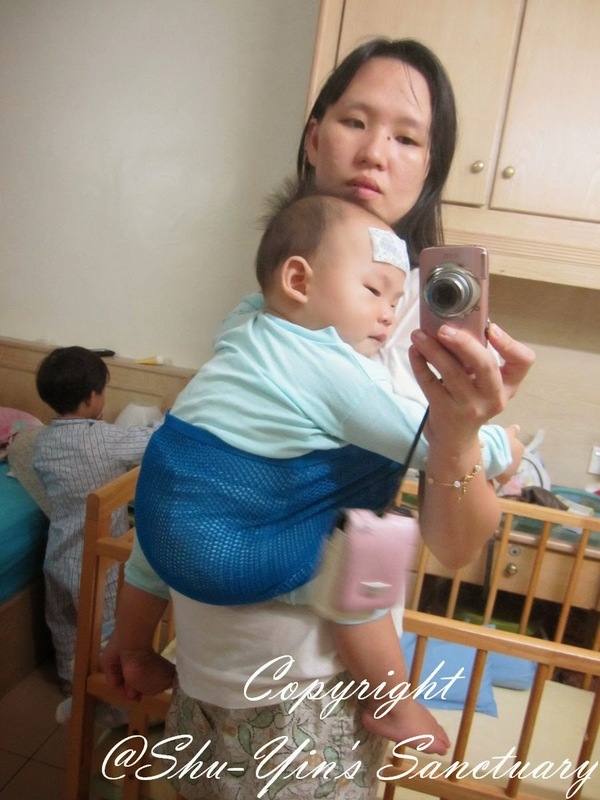 The baby sling somehow stretches and then hangs and support Khye's weight steadily. SUPPORi supports the C-curve of the baby's spine. One of the best features of SUPPORi is its elasticity. It does not extend longitudinally, but it extends horizontally. 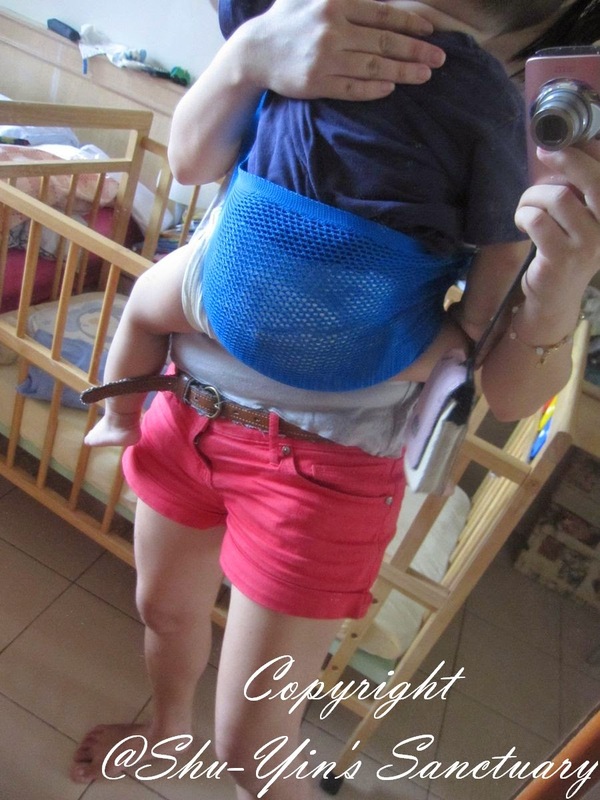 When you carry your baby by SUPPORi, the net fits snug maintaining baby's C-curve. Legs are flexed, the hips joints sit securely in the socket. SUPPORi also helps maintains the orthopedically ideal position of the legs - the M-shape. Knees are higher than their bottom keeping legs supported up close to the knee area. 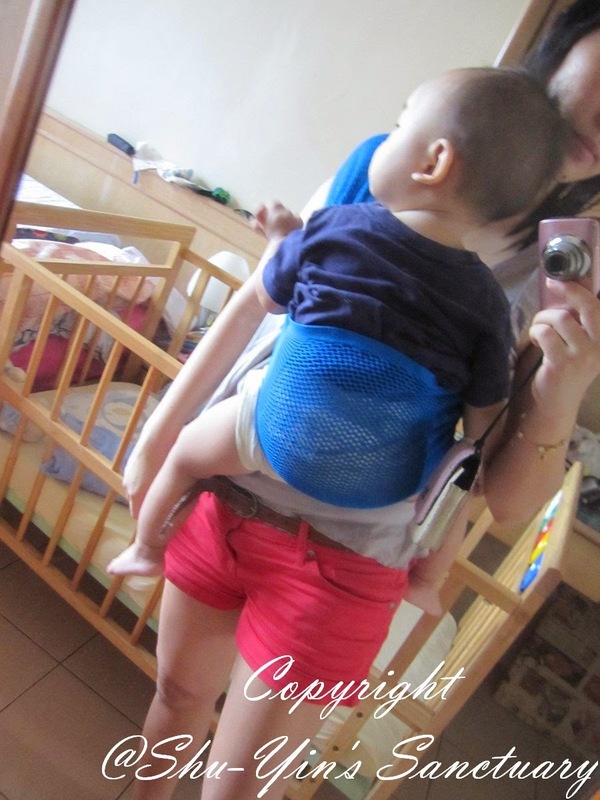 When Khye was fussy at home, it was easy to whip out this light and airy SUPPORi to babywear him at home. My other baby carriers are a bit too hot to be worn at home if I don't turn on the air conditioning. So SUPPORi was perfect for home. Look at Khye's grumpy face. He wasn't too happy and clung on to me and wanted me to carry him, so I babywore him to ease my back and my hands. Shern wanted to take a photo too when he saw hubby taking photos of me and Khye. So ok 2 photos of Shern with us. See Khye's lemak face when at last I babywore him and he was happy and gave me a big smile! Sometimes all he wanted was to be near to mummy. Sigh. What to do. And when he got sick, he was a super clingy baby, and that time it was necessary to babywear him. If not, I think I would have sore hands and back. Khye was such a big baby. 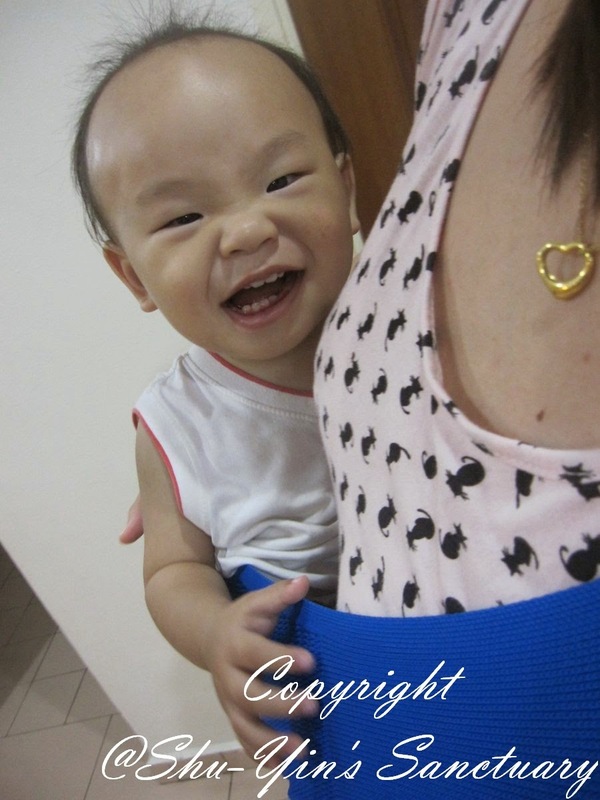 And previously I did babywear him using my Ergobaby because he was admitted to the hospital. But then it was not so serious this time so he just stayed at home to recuperate and no aircond at home, so SUPPORi did the job. 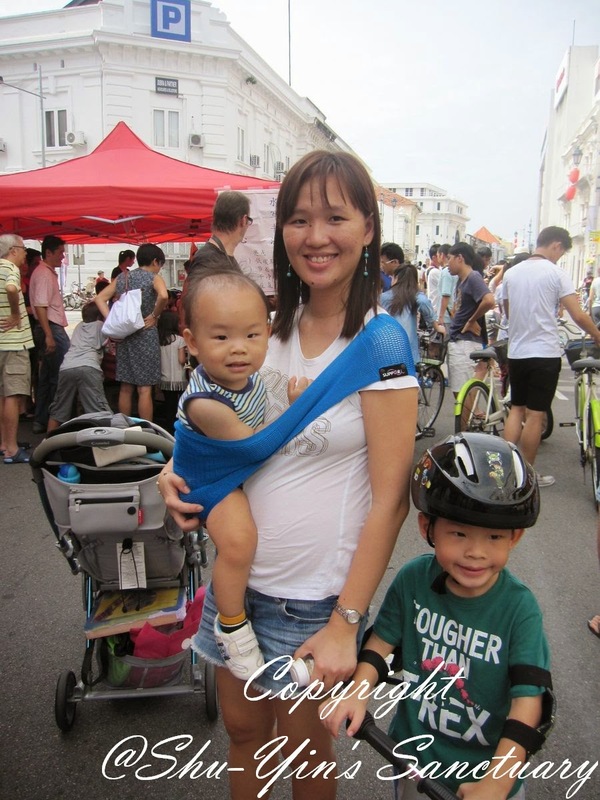 Airy and yet make babywearing breathable and easy! And then we also tested it when we were out, like during our visit to Occupy Beach Street. It was an outdoor mid-morning outing so I knew it would be hot. And since we brought the stroller and Shern's scooter along, I didn't want to carry a big baby carrier, so I just took the SUPPORi in case Khye didn't want to sit in the stroller halfway. I was right. Khye was fussing and so I needed to babywear him. A photo of me and Khye and Shern at Occupy Beach Street. I love that the SUPPORi is so light and compact, and only weighs about 80g. 80g is a barely there weight, believe me. Hold it in your palm, and I think it is lighter than many of our mobile phones. With a gazillion things in my diaper bag, I'm grateful that this baby sling is so light and compact and fitted easily inside my diaper bag, or even my handbag, or my palm. It was a breeze using it outdoor to carry fussy Khye. No buckles to snap and nothing to wrap. Just popped him into the sling. He was sleepy by then and thus wanted me to carry him. And he slowly drifted off to sleep with my walking pace rock. And I could still do sightseeing and shopping with me babywearing him, and still got 2 hands free! I babywore him for about an hour plus and it was still alright for my shoulder. No pain or strain. But when it reaches the 2nd hour, I could feel a bit uncomfortable. And it would be better for me to change sides (from left shoulder to right shoulder or vice versa). 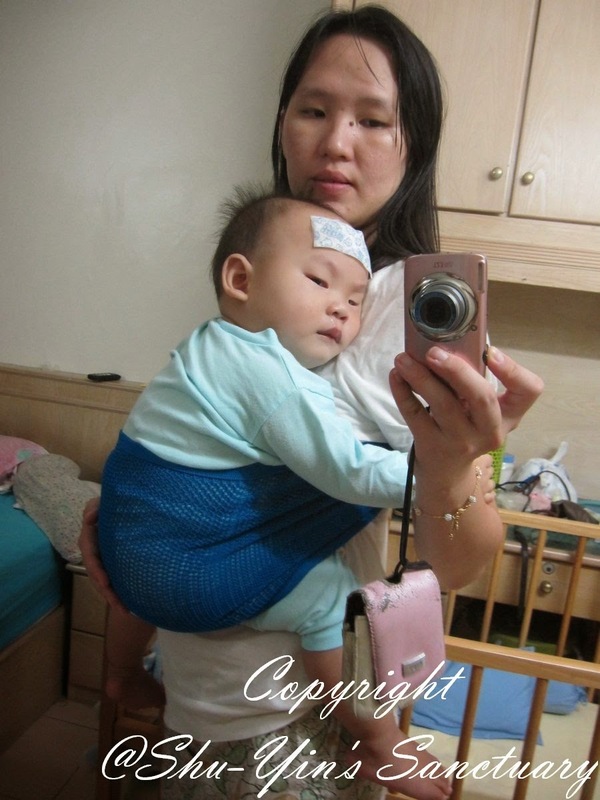 So I should say 2 hours is the max for me to use this sling on Khye. I think everyone's different, so you need to test it out yourself. 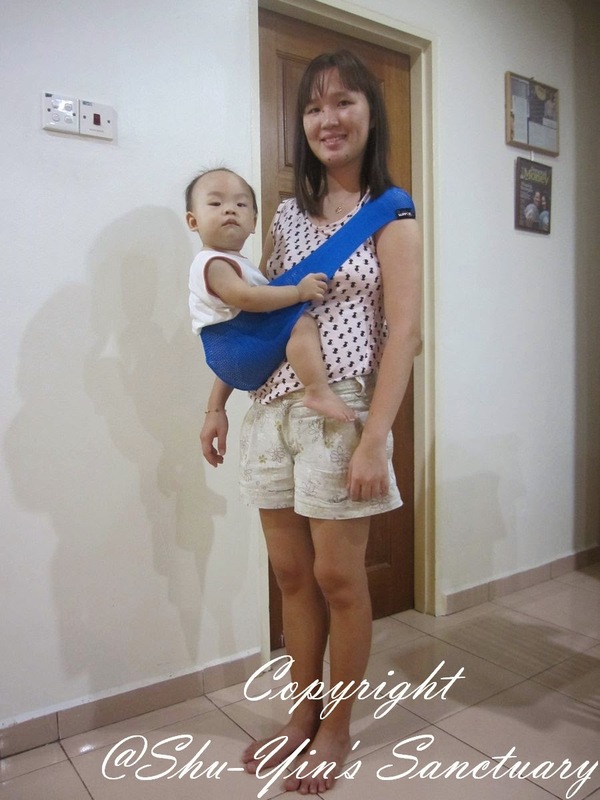 But basically, this SUPPORi baby sling is meant for shorter usage, and not whole day usage. Ok, so now what is the downside of SUPPORi? The only downside I could think of is I noticed some red line marks on my baby's thighs after I removed him from the baby sling. It is nothing serious, but some red marks from the sling. Khye doesn't make uncomfortable noise or cry (believe me, he will if he is uncomfortable!) so I think he was not in pain or anything. Just like sometimes I do get red marks from wearing an elastic band shorts, and I don't feel uncomfortable or anything, so I think it is the same. Easy. 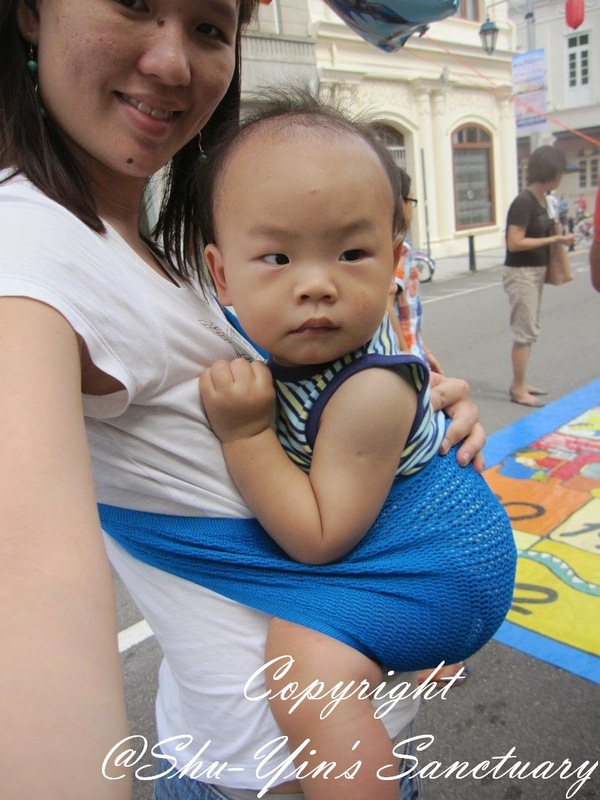 Just let him wear shorts/pants before babywearing him using the SUPPORi. Then, no more red marks on his chubby thighs! Another thing I like about it is how easy it is to wash and dry. It can be both hand washed or machine washed. I tried both. Firstly, I hand washed it. The colour bled a little, so remember to wash it separately. And it took just a few hours for it to dry even without the sun! ho ho ho! No more waiting a day for my carrier to be dry. I also tried dumping it into the washing machine. I put it into a laundry net, and chose gentle/delicate wash function. It came out alright and just need a little re-shaping once it was out from the machine. And please note that SUPPORi Baby Sling follows the size of the wearer, and not the size of your baby. I fall in between size, and usually the smaller size is recommended, as a snug fit is optimal. But for me, as Khye was rather big, I was more comfortable to get the bigger size. Below is the Sizing Table Guide. 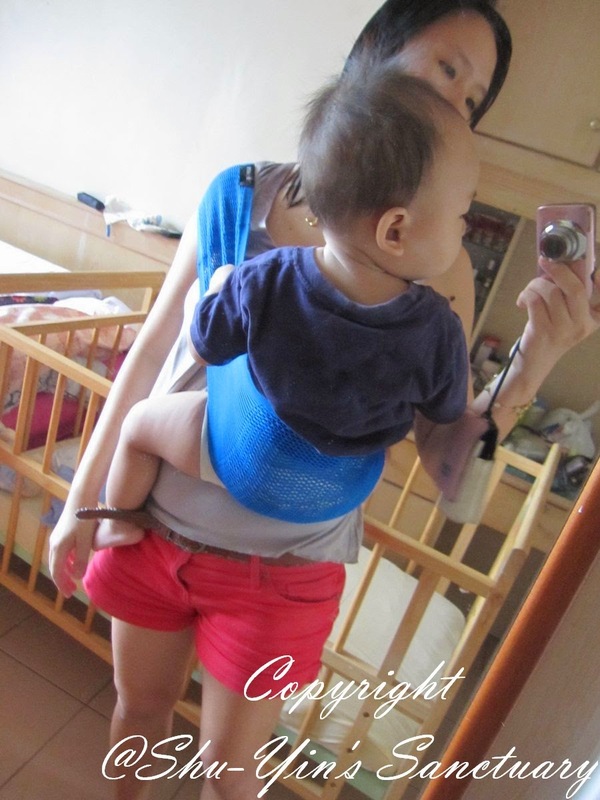 Although I did not try it myself, I know this baby sling would be perfect for pool/beach use. 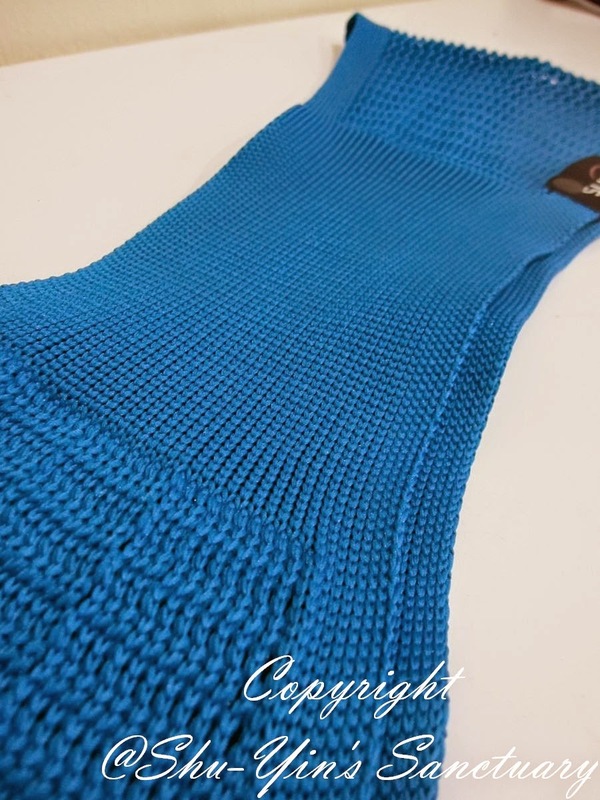 Its mesh material is so water-friendly and dry easily. And it won't weigh you down although wet. Perfect, right? Overall, I'm more than happy with my SUPPORi baby sling. I like to use it for the just-in-case scenario if I needed to babywear, since it is so light and portable and could fit into my handbag easily. 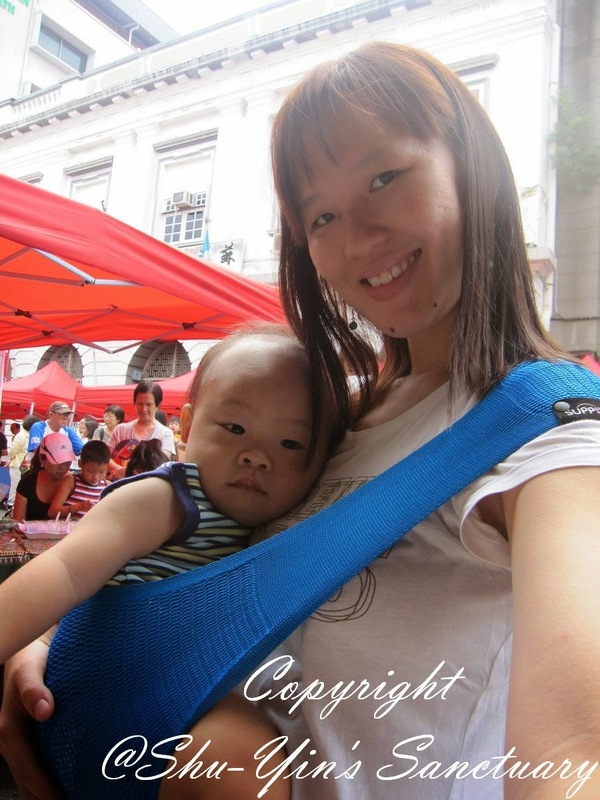 As long as I don't use it for too long, it provides me a fuss-free babywearing experience! 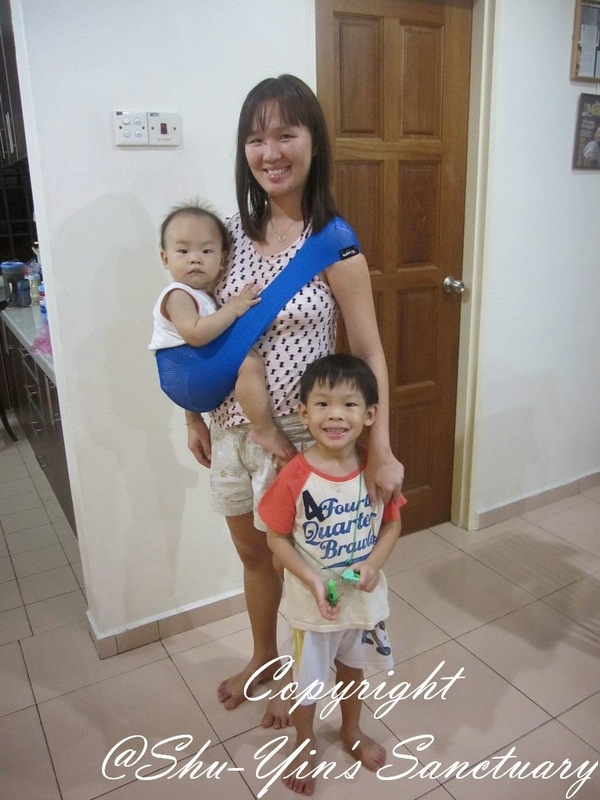 Please visit The Mummytoon's Website to purchase the SUPPORi Baby Sling . Browse around as they have quite a wide selection of mummy and baby essentials listed on their website. For Singapore readers - There is FREE SHIPPING for orders over SGD$100 to Singapore addresses. - 5% off any regular-priced items STOREWIDE with a minimum purchase of SGD$50 at their Website, valid until 31st August 2014, using discount code MTMD5% upon checkout. 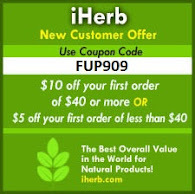 - FREE SHIPPING still applies if meet criteria. I am pleased to announce that Mummytoon is sponsoring 1 piece of SUPPORi Baby Sling to a lucky winner! Giveaway ends on 28th May 2014 (Wednesday) 11.59pm Malaysian time. For more info, you can also visit Mummytoon's Website. Or you can visit the official Website and Facebook Page for Singapore and Indonesia. * Disclosure: I received a SUPPORi Baby Sling for review purpose, but no monetary incentive was received. All text and opinions are of my own and represents my honest opinion of the product(s). 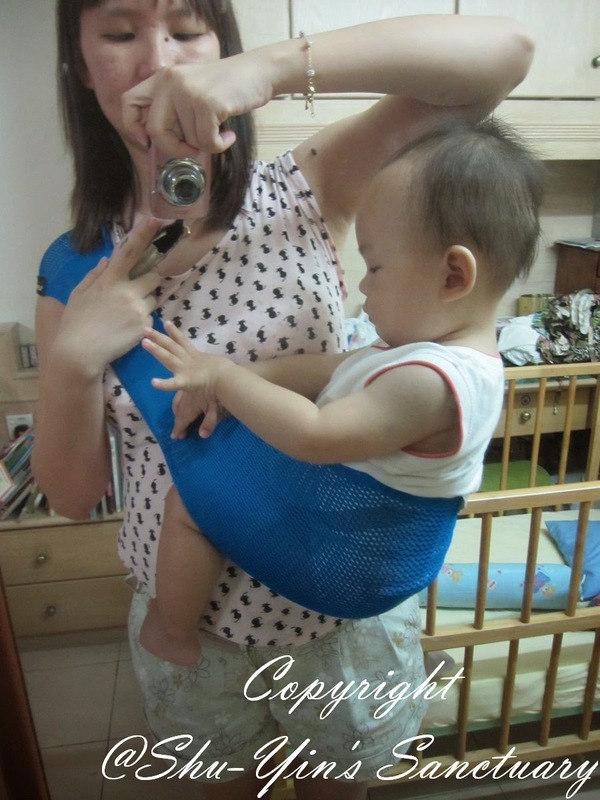 I've seen the superior sling before but was rather apprehensive that such a lightweight material could provide sufficient Babywearing support for baby. But knowing you as an avid babywearer, I definitely trust your review and would be keen to try it out! I had my eyes glued on the light olive green. I would love to win this as it will greatly ease me in carrying my baby without compromising style. With this SUPPORi baby sling we'll definately have more bonding time as I'll be able to carry my baby longer and further. Others sling in the market looks clumsy, whereas this is simple and effective. Thanks Shu-Yin for reviewing such an awesome product. 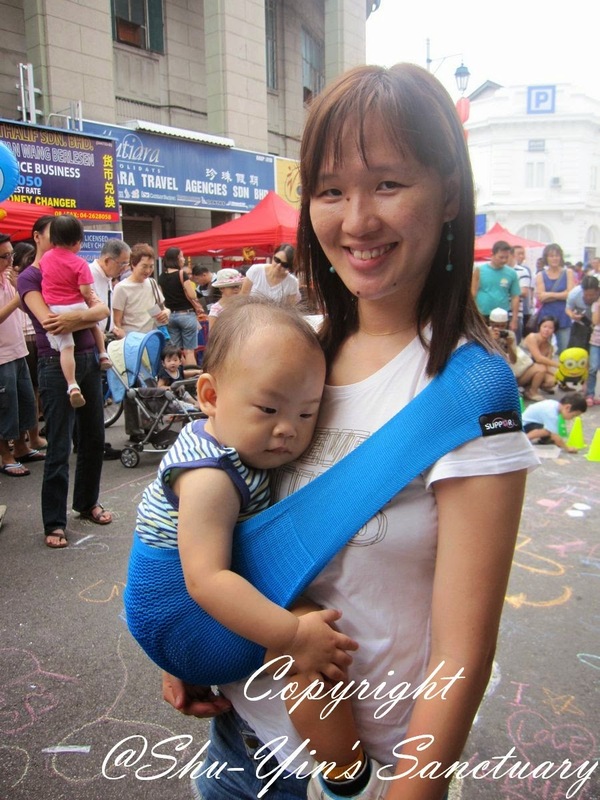 I love sling and would like to try SUPPORi baby sling! I want this so so much! I want this in French color!! I like the french color. I want to use this to carry my LO. 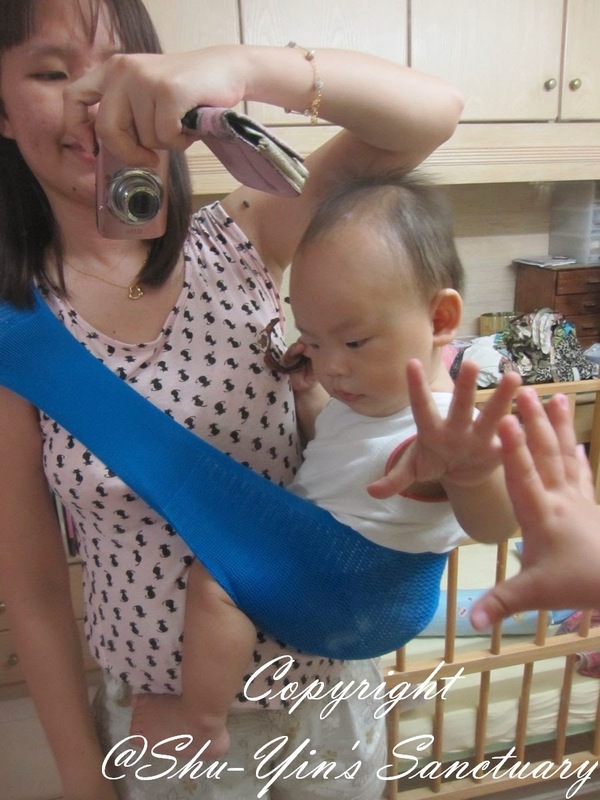 Looks like a wonderful product especially when baby is clingy and when we need an extra pair of hands!... thanks for the chance to win! I like the lavender one coz I love all things purple and the sling allows me to go shopping easily as I can keep my hands free! I like caramel pink! 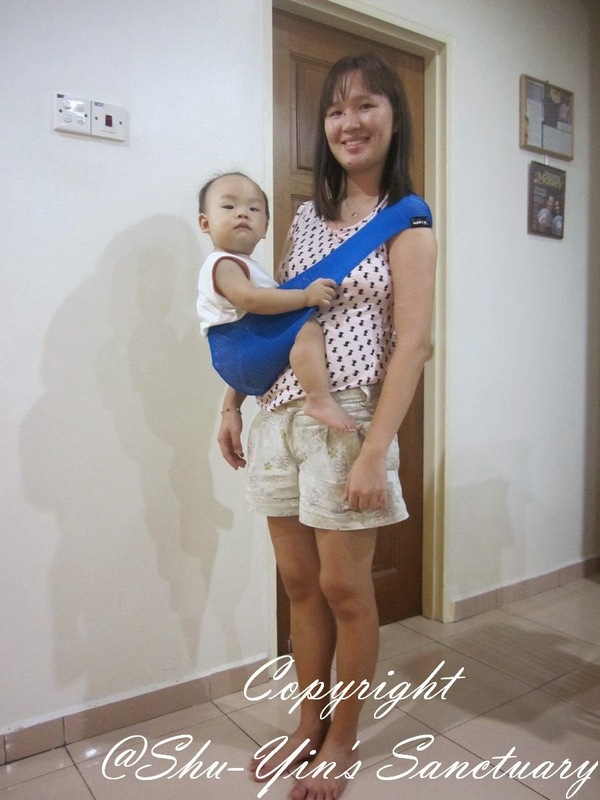 I have an ergobaby which i use for long trips but it is hot and bulky and I need help to put it on. SUPPORi looks perfect for short trips and it looks easy to use. Simple, easy and hassle free, definitely would love to own one ...Salmon colour should be it. Bright blue please! Love the bright unisex shade. This carrier would be useful for my 3 months old daughter when she is fussing (which is like always) and I need to get some housework done.